As the Fort Wayne Museum of Art continues to grow into its new building, the product of its capital campaign renovations completed in Spring of 2010, it has made a stronger and more concerted effort to represent more contemporary work and works by local and regional artists through its regional gallery (the "hallway" between its newer and older galleries) and by working with curators to bring a fresh and less institutional view of the arts. Josef Zimmerman has been one of those curators promoted by the museum to bring new work to them, and he has successfully done so in the past with exhibitions like "Brilliant Optics" over the summer of 2013, and now, with "Biological Canvas" currently up through June of this year. In "Biological Canvas," a three person exploration of the use of hyperreal biological forms being incorporated into the work of contemporary artists working across a broad spectrum of practices, Zimmerman notes that their work explores biological, mythological, and anatomical forms as well as fantastic uses of color and form. More than anything else, "Biological Canvas" explores the intriguing trend in certain realms of contemporary art: the intentional reference of biological processes—anatomical forms, psuedo-natural biomimicry, and connections to human systems, and other elements of a medical world—in the context of contemporary culture. Through the introduction of these three artists, Scott Teplin, Justin Henry Miller, and Yis "Nosego" Goodwin, Zimmerman was also able to connect that all three artists give some importance to their childhood to the creation of their work, harkening back to the importance of the subconscious in the Surrealist tradition. "NoseGo" is a gallery and street artist from Philadelphia, well versed in both the production of commodity pieces as well as mural installations. His collaged vibrant images are as concerned with color as they are delicate forms. NoseGo's work produces an interesting connection between seemingly disconnected objects in the environments around us. Through these "unseen connections", like an examination of the semi-mythical dark matter described by cosmologists, NoseGo's images are filled out with ghostlike semi-translucent frameworks surrounding the opaque characters in the viewer's focus. While NoseGo describes his compositions as maps of the way that we learn and the accumulated descriptions of those lessons, he also makes references to his compositions being, in some way, the result of his childhood memories of looking into his toy box to find a chaotic mess of toys, which seemed to become one conglomerate creature. This description can be seen in certain images like "Field Notes" and "Other Channel", we see consistent use of the near architectural white underpinnings to biological, Seussian characters which take on both bright, graphic forms, as well as more "sophisticated" styles of illustration. The resulting images tend to look like something crossed between the father of contemporary street art Barry McGee and the Spanish surrealist Roberto Matta. Scott Teplin's work is somewhere between a visual fantasy and a medical disaster. Deconstructed mechanical and technological structures expand and collect to produce mesmerizing images which allow the viewer to fall far into the picture plane in a near kaleidoscopic effect. By further exploring the interior spaces of Teplin's images, described by ink and watercolor, Teplin produces matte, objectified landscapes which make clear the boundaries between reality and the virtual space of the picture plane. This method of image making references the medical illustration found in an academic text though the content is differs so greatly. Teplin mentions in his artist statement that he originally wanted to follow in his father's footsteps as a surgeon and that he loved looking through surgical manuals in his developing years, thus the apparent references to medical illustration. Teplin was fascinated by the disconnect between the illustrations and what the actual flayed bodies look like, and how surgeons were able to take the abstract information in one and apply it to the other. Similar to Justin Henry Miller's work, Teplin carries overt themes of sexuality and humor as he turns the inorganic structures of man into "sexualized lubugrous forms" which can be seen in "Tuber Natural" and "Flu Sauce." In the end, Teplin's work seems to proclaim one common message above all else, being that all biological bodies are wet, ambiguous forms, and composed of countless interacting parts to produce a near gelatinous whole. Justin Henry Miller's work originates from his personal experiences growing up on a horse farm where the animals were toyed with in ways that produced what could be considered "mutant" mistakes of selective breeding, artificial insemination, and other forms of husbandry. Miller's work can range from dystopian to humorous with its use of high-tone colors, outlined and highlighted "cartoonish" forms, and more than a few hyperbolic references to the dead, undead, genitalia, and gore. Miller notes, "I approach my work by imaging the experiments that have gone awry and try to create a world where the byproducts resist expiration." 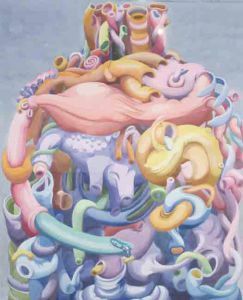 Somewhere between the doodling of a pre-teen and hyperreal paintings of Salvador Dali, mixed with science fiction and medical fact, Miller's work always finds a way to satisfy its audience. In pieces like "Avalanche", Miller uses his technical prowess to represent cyborg flesh, and in "Mixed Necropsy" Miller gives a spread of body parts being connected through basic lines built out of the etching process which connects to Teplin and NoseGo's use of graphic drawing in what at times is seen as a more "basic" art. Zimmerman's keen foresight to pull these three contemporary artists together has created an incredibly entertaining exhibition which draws together myriad contemporary concerns and presents them through disarming and many times humorous methods. 3 people	reviwed this story with an average rating of 5.0.